Keep warm on cool days with the MSR Rebound jacket. Perfect for when the weather gets cold, this stylish jacket has many features you wouldn't expect to find. The most notable is probably the interior iPod pocket. Those these are becoming more common on this type of jacket, it's still not that common to find them. The jacket is water resistant, with a warm lining to keep you warm and dry when the weather gets raw. Hand warmer pockets are oversized for extra storage. Other interior pockets provide more space for your stuff. 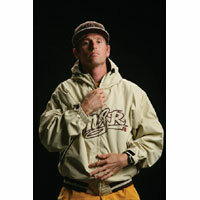 The fit is adjustable with a drawstring hood and adjustable cuffs. And of course, you'll be shouting out your brand allegiance with the MSR logo flying across the chest. Also see this Mens Thor Sweatshirt Hoody if you're looking for something a bit more classic.